The only brand of granary flour I have been able to find is from Hovis. This British company was started in 1886 by Richard ‘Stoney’ Smith, a miller from Macclesfield Cheshire. The wheat is malted and this adds the most amazing flavour to the bread once baked. Anyone visiting from the UK is more than welcome to bring me a kilogram of this flour as a gift. 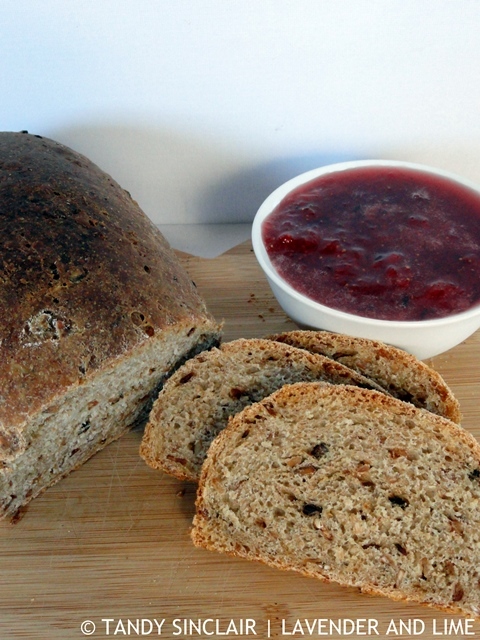 I made several loaves of this granary bread to enjoy with my homemade jam. I have been flattened by the heat. Normally I am quite used to the fact that February is heat wave month. But this year, someone got it very wrong and our heat wave started in December. I have coped quite well in my opinion, walking in the morning before it is too hot, and going about my gym routine at a slow but steady pace in the afternoons. I have spent a lot of time cooling off in the pool and my swimming costume has become the most worn item in my wardrobe. But on Monday it was just too much. By 8am I was hot and bothered. I turned the fan on next to my desk and wet my dress! This is the first summer I have worn a dress in years but anything more than that is just too stifling. At noon I succumbed to the heat and started making plans to leave the office. Our delivery truck arrived shortly after lunch and as soon as I had done my work I went home. It was humid and I felt wiped out by the heat. I wallowed in the water, searching out the cool spots and eventually when Dave got home we sat in the water having our evening tipple. What do you do to cool down in summer? 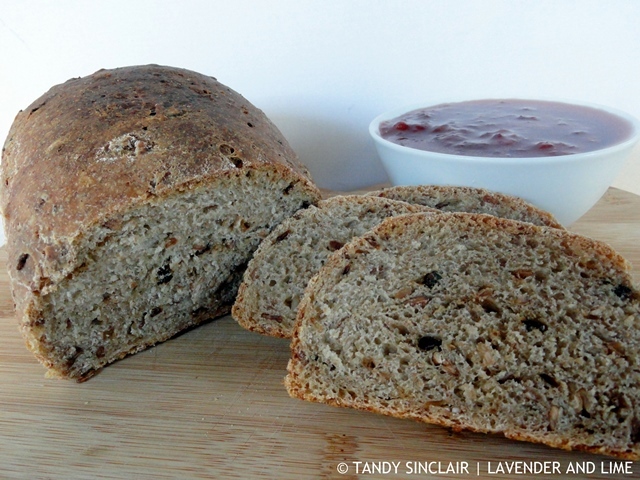 This bread makes use of malted wheat grain flour and sourdough starter. I believe that you can only find Hovis Granary flour is because they trademarked the word. That’s why other flours may be called ‘multi-grain’ etc. Haven’t checked this so might be wrong but it popped out from the back of my brain somewhere! I admire anyone that can make bread work, I haven’t had much luck …. ever. Sigh! I am addicted to making a good loaf of bread! Tandy, I wish you could send some of that heat my way – I LOVE the heat – a run in the morning usually keeps me from being bothered by the heat too much! BTW – this loaf looks lovely! malted wheat flour? wow got to get my hands on some and the bread look amazing. Stay cool! I’ve never heard of granary flour. The bread looks delicious. This looks so delicious! I am quite new in baking! I am more in cooking 🙂 Is this difficult for the beginner like me? What a delicious loaf of bread!! I have tried using a sour dough starter but I have to admit, I don’t have the patience most of the time to keep feeding it. I admire anyone that can care for a sour dough starter. My friend in Perth says it has been super hot! Your bread looks delicious, I bake bread a lot and a good granary loaf takes some beating. Enjoy your summer, cold and very wet here! I would swap one wet day with you any time! Yum. I admire your baking. Oh, this bread just look super tasty! I haven`t baked bread by myself but I am thinking abut it. I have even bought myself a bread baking machine but it is just standing on the shelf. I guess it is time to do something!